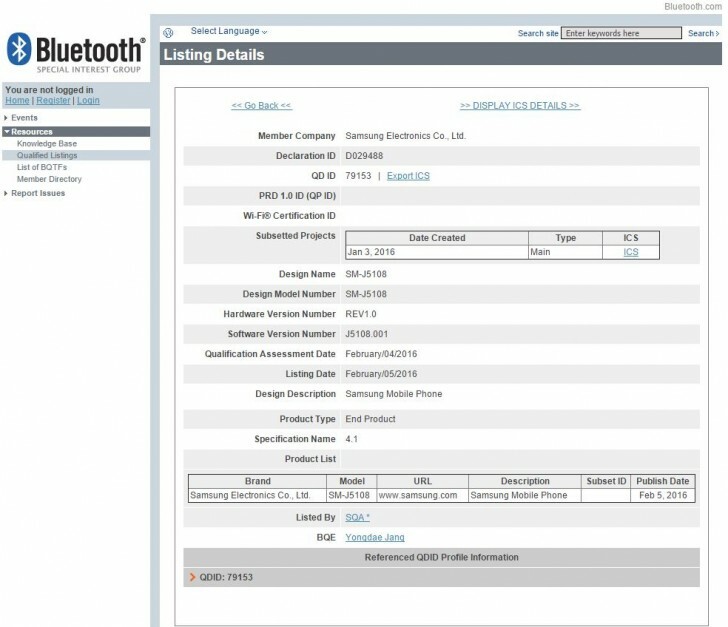 The Samsung Galaxy J7 (2016) and the Galaxy J5 (2016) are now one step closer to market launch, as they successfully passed Bluetooth SIG certification. The predecessors of the two phones came out in June 2015, but the 2016 editions might be a little early. According to leaked benchmark results, the Galaxy J7 (2016) will have two versions - one with an Exynos 7870 chip, and another with a Snapdragon 615. The two versions will have different screen resolutions on the 5.5" display and RAM. The Exynos one will tout a 720p screen and 2GB of RAM, while the Snapdragon model will come with 3GB of RAM and 1080p display. The chipset of the Galaxy J5 (2016) has also been revealed through a leaked benchmark, and it's going to be a Snapdragon 410 one with a 1.2 GHz quad-core Cortex-A53 CPU. The other known specs so far include a 12 or 13 MP rear camera with LED flash, a 5 MP selfie shooter, 2GB of RAM, and 16GB of built-in storage. Pricing and availability are yet to be announced. While MWC 2016 is a good opportunity for Samsung to officially reveal the phones, the company is unlikely to risk drawing any attention away from the Galaxy S7 lineup so those will probably come at a different point. Does j5 2016 contain ambient light sensor? I am not going to spend RS 15990 for mobile without light sensor, as it is also present in phones below RS 10000. This will be a perfect phone if only ambient light sensor is included. Most of the phone nowadays has ambient light for auto brightness and too bad for J series none of them have it.